In love with Formula 1: Chinese GP: A worst case scenario at the start! Drama seems to have been the word describing the Chinese GP weekend. So was the case in today´s race. The start was eventful and dramatic: Red Bull´s Ricciardo stormed to the lead from P2 with Rosberg right at the Australian´s tail. 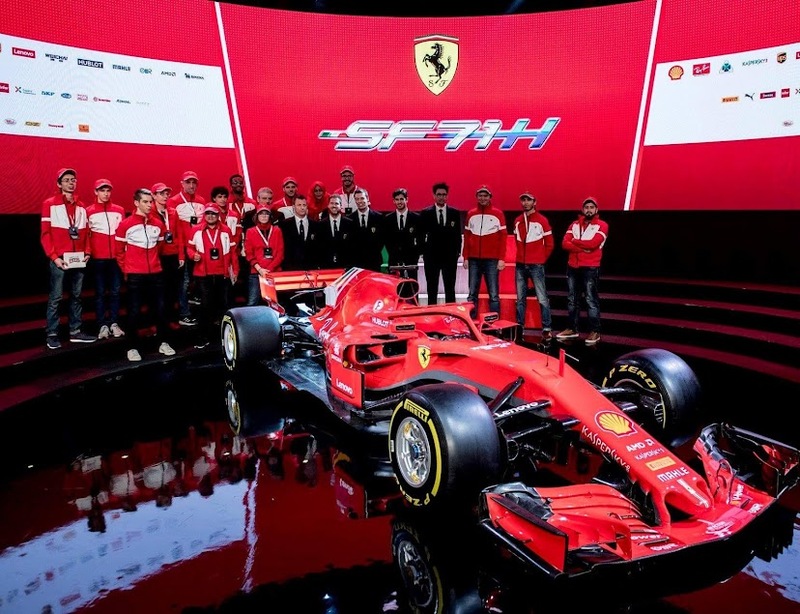 Ferrari´s start was a worst case scenario; Red Bull´s Kvyat took a rocket start and saw space in the inside line going into Turn 1, but Vettel wasn´t prepared for the Russian´s move, which lead to a collision between the Ferrari teammates! Kimi lost his front wing due to the collision and Sebastian´s front wing got some damage, too. Kimi had to pit for a new nose and Sebastian dropped down many positions as well. Sebastian was clearly upset about the collision and felt urgent need to explain the incident on the team radio, saying there was nothing he could have done to avoid the contact. I honestly believe a collision was the last thing that Sebastian would have wanted in the race! Sebastian is extremely hard on himself so I can imagine how he blames himself for the incident. Starting from the back of the grid wasn´t the only challenge that Hamilton was facing today. The Briton, too was involved in a first corner collision with Sauber´s Nasr and lost his front wing as well. On lap 3 there was more drama. Rosberg was right at Ricciardo´s tail when suddenly Ricciardo´s left-rear tyre exploded! There was debris on the track after the first lap collisions so that was probably the cause for Ricciardo´s puncture. Luckily the puncture happened near the pit entry so it didn´t take too much time to get the car into the pits. But such a shame for Ricciardo, who had had a stunning start to the race! Safety car was deployed as there was so much debris on the track. Behind the safety car the top five was very surprising (not the lead though): Rosberg was leading, Williams´ Massa 2nd, McLarens´s Alonso 3rd, Manor´s Wehrlein 4th and Haas´ Gutierrez 5th. Sebastian was down in P14 and Kimi even further down in P19 at this stage! When safety car came in Sebastian started aggressively make his way through the field. Margherita´s nose had been changed in the first pit stop, but on lap 11 Sebastian got a new front wing damage; the German forced an overtaking move on Williams´ Bottas but not without a slight contact, which damaged the end plates of Sebastian´s front wing. Sebastian, however, didn´t even notice the damage so it didn´t have too much affect on the runnability of the car. On lap 16 Rosberg was leading the race with Red Bull´s Kvyat 2nd and Williams´ Massa 3rd. Sebastian had already made his way up to P4. At this point Kimi´s pace didn´t look as promising as I would have wanted it to be; I was wondering if Kimi´s SF16-H had got some damage in the first corner collision with Sebastian after all. But towards the end of the race Kimi´s pace was improving and Kimi´s last stint on the soft tyres was impressive. Red Bull´s Ricciardo had made a great recovery as well and the Australian was flying at the end of the race. It was very refreshing to see Red Bull being so competitive today. Ricciardo actually managed to overtake Hamilton on track, which was a surprising turn indeed. Only a moment later the Australian attacked on Massa and jumped to P4. Towards the end of the race Kimi got everything out of his car and showed some spectacular overtaking. Kimi´s compatriot Bottas could do nothing but surrender when the Iceman determinedly made his way past the Williams pilot. Soon Kimi smelled Hamilton´s blood and was right at the Briton´s tail. And Kimi made a move on Hamilton and got past! It was an impressive move, although it was obvious that Hamilton´s car wasn´t running perfectly after the first lap collision. Only a moment later the Iceman was targeting Massa. Another awesome overtaking move and Kimi had made his way up to P5! An impressive recovery after the horrifying opening lap! Nobody was able to prevent Rosberg from winning today. And the German did it dominantly by 40 seconds! Sebastian finished 2nd, which was a staggering achievement considering the start of the race. When Sebastian was congratulated on the team radio for his 2nd place, Sebastian repeated his humble apologies to the team for the collision. I´m sure Sebastian´s joy was overshadowed for his guilt for the collision with Kimi. Nevertheless, Red Bull´s Kvyat finished 3rd and Ricciardo 4th, which was a brilliant result for Red Bull. Kimi finished 5th, Massa 6th and Hamilton 7th. A few laps before the chequered flag Bottas was in P8 but on dying medium tyres the Finn couldn´t prevent the Toro Rosso duo Verstappen and Sainz from overtaking him, so the Finn had to settle for P10 and only one point. This proved that Toro Rosso is a serious contender for Williams this year. I was very happy to see Verstappen finish in P8 today. Rosberg has had a dream start to the season; 3 wins from 3 races and the maximum of 75 points. Hamilton is still second in the championship standings, 36 points down on his teammate. Ricciardo is 3rd with 36 points, Sebastian 4th with 33 points and Kimi 5th with 28 points. Mercedes has now a 63-point gap over Ferrari in the constructors´ standings. Hamilton has had problem-filled first three races so I´m sure he will bounce back extremely hard when he has a problem free weekend. There´s definitely more to come from Hamilton, I believe. I can imagine that there are many thoughts going through Sebastian´s mind at the moment. He seems to feel extremely guilty for the collision with Kimi and he humbly apologised to both the team and Kimi. I sincerely believe that he didn´t do it on purpose. In the pre-podium room there was a heated conversation between Sebastian and Daniil Kvyat. Kvyat was absolutely right; every racing driver would have done the same and taken the risk of choosing the inside line. This is racing: taking risks, challenging your rivals and having heated moments! Sometimes it means a collision with your teammate. But what I appreciate a great deal is that when something like this happens, Sebastian is humble enough to apologise. I´m sure both Sebastian and Kimi are mature enough to discuss the incident, learn from it and put it all behind them.